Jain monasticism refers to the order of monks and nuns in the Jain community. The term nirgrantha ("bondless") was used for Jain monks in the past. The monastic practices of two major sects (Digambara and Śvētāmbara) vary greatly, but the major principles of both are identical. Digambaras use the word muṇi for male monastics and aryika for female monastics. Digambara monks are also called nirgrantha (without bonds). Śvētāmbaras use the word sadhvis for female monastics. Historians believe that a united Jain sangha (community) existed before 367 BCE, about 160 years after the moksha (liberation) of Mahavira. The community then gradually divided into two denominations: the Digambara and the Śvētāmbara. Acharya Kundakunda is the most revered acharya (preceptor) of the Duḥṣamā period of the present avasarpiṇī (descending) era. Five mahāvratas (Great Vows), from Mahavira's teachings, are followed by all Jain ascetics. Although Jain householders are also required to observe them, ascetics are bound more strictly. Digambara monks follow 28 vratas (vows): five mahāvratas (Great Vows); five samitis (regulations); the five-fold control of the senses (pañcendriya nirodha); six Şadāvaśyakas (essential duties), and seven niyamas (restrictions). 24. Asnāna Not to take bath. A Śvētāmbara initiation involves a procession in which the initiate symbolically disposes of his material wealth and makes donations. This is followed (or preceded) by another ritual in which the initiate receives an ogho (a small broom made of wool) from their mentor as a symbol of welcome into the monastic order. The initiate then puts on monastic clothing and pluck out hairs by hand. Further rituals formally initiate them into the monastic order. The Śvētāmbara Terapanth sect requests written permission from a person's parents before initiating them into the ascetic order. The earliest known texts often ask for ascetics to be in complete solitude, identifying the isolation of soul and non-soul. However, soon after Mahavira's nirvana ascetics organized themselves into groups. A few examples of ascetics living in complete solitude are found in the Digambara sect. Jain ascetics are detached from social and worldly activities; all activities are aimed at self-purification for self-realization. They follow established guidelines for daily worship and austerity. The monk's daily routine is broadly structured by three ideological formulae: the five great vows (mahavrata), the eight matrices of doctrine (pravacana-matrka), and the six obligatory actions (avasyaka). The first two are restrictions, and the third is positively framed in what the monk is encouraged to do daily. Ascetics do not have a home or possessions. They choose austerity, avoid services such as telephones and electricity. Monks engage in activities such as meditation, seeking knowledge and acquiring self-discipline. The Yati of the Śvētāmbara sect and the Bhattaraka of the Digambara Terapanth do not wander; they usually live in temples and perform daily rituals. The monks rise before dawn, most around 5:00 a.m. but some as early as 2:00 a.m. In observance of utsarg-samiti, defecation takes place in the open where feces does not harm living creatures; urination is into a shallow pan, which is emptied onto a dry patch of ground. In the Digambara tradition, an ascetic rises from kshullak (one who uses two pieces of cloth) through Ailak (uses one piece of cloth) to muni (or sadhu). Over time a number of designations were mentioned in shastras, such as gani, pannyas and pravartak. The Śvētāmbara Terapanth sect has a new rank of junior monks, samana. Observing complete abstinence, male Digambara monks wear no clothing. Aryikas wear plain, seamless white sarees. All Digambara monks and nuns traditionally carry only three things: a mor-pichhi (peacock-feather whisk), a kamandalu (water pot) and shastras (scriptures). Śvētāmbara monastics wear white, seamless clothing. Chaturmas is the four-month monsoon period during which ascetics stay in one place to reduce the risk of accidentally killing insects and other small forms of life which thrive during the rains. This period is suitable for sravakas to renew their faith by listening to teachings of the dharma, meditation and vartas (acts of self-control). During Chaturmas, the chief sadhu of each group gives a daily pravacana or vyakhyana (sermon) attended mostly by women and retired men but on special days by most of the lay congregation. During their eight months of travel, the sadhus give sermons whenever requested (most often when they arrive in a new village or town in their travels). The Venerable Ascetic Mahavira for a year and a month wore clothes; after that time he walked about naked, and accepted the alms in the hollow of his hand. For more than twelve years the Venerable Ascetic Mahavira neglected his body and abandoned the care of it; he with equanimity bore, underwent, and suffered all pleasant or unpleasant occurrences arising from divine powers, men, or animals. 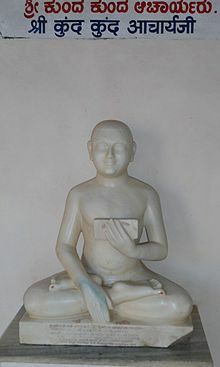 Henceforth the Venerable Ascetic Mahavira was houseless, circumspect in his walking, circumspect in his speaking, circumspect in his begging, circumspect in his accepting (anything), in the carrying of his outfit and drinking vessel; circumspect in evacuating excrement, urine, saliva, mucus, and uncleanliness of the body; circumspect in his thoughts, circumspect in his words, circumspect in his acts; guarding his thoughts, guarding his words, guarding his acts, guarding his senses, guarding his chastity; without wrath, without pride, without deceit, without greed; calm, tranquil, composed, liberated, free from temptations, without egoism, without property; he had cut off all earthly ties, and was not stained by any worldliness: as water does not adhere to a copper vessel, or collyrium to mother of pearl (so sins found no place in him); his course was unobstructed like that of Life; like the firmament he wanted no support; like the wind he knew no obstacles; his heart was pure like the water (of rivers or tanks) in autumn; nothing could soil him like the leaf of a lotus; his senses were well protected like those of a tortoise; he was single and alone like the horn of a rhinoceros; he was free like a bird; he was always waking like the fabulous bird Bharundal, valorous like an elephant, strong like a bull, difficult to attack like a lion, steady and firm like Mount Mandara, deep like the ocean, mild like the moon, refulgent like the sun, pure like excellent gold'; like the earth he patiently bore everything; like a well-kindled fire he shone in his splendour. ^ B.K. Jain 2013, p. 62. ^ Zimmer 1953, p. 223. ^ a b c d Dundas 2002, p. 152. ^ a b c Dundas 2002, p. 45. ^ Jain 2011, p. vi. ^ Jain 2013, p. 196-197. ^ Jain 2011, p. 93–100. ^ Jain 1926, p. 26. ^ Jain 2012, p. 144-145. ^ Jain 1926, p. 32-38. ^ a b c d Jain 2013, p. 196. ^ Jain 2012, p. 143. ^ Jain 2013, p. 190-191. ^ Jain 1926, p. 46-47. ^ Jain 2013, p. 197. ^ Dundas 2002, p. 155. ^ Dundas 2002, p. 153. ^ a b Cort 2001, p. 101. ^ Singh 2007, p. 29. ^ Valley, Anne (2002). Guardians of the Transcedent: An Ethnography of a Jain Ascetic Community. University of Toronto Press. ^ Singh 2007, p. 119. ^ Zimmer 1953, p. 210. ^ Singh 2008, p. 316. ^ Cort 2001, p. 104.